It is always easier to say “No.” Every year I get a few invites for international trips combining speaking, judging, and/or brewing. With only so many vacation days each year, I can't go everywhere I'm invited. I love talking to locals with shared interests (and the free flight and hotel doesn't hurt), but it means a few days spent being on rather than relaxing. Sometime though an event, place, or people are enough to turn my answer into "Yes." 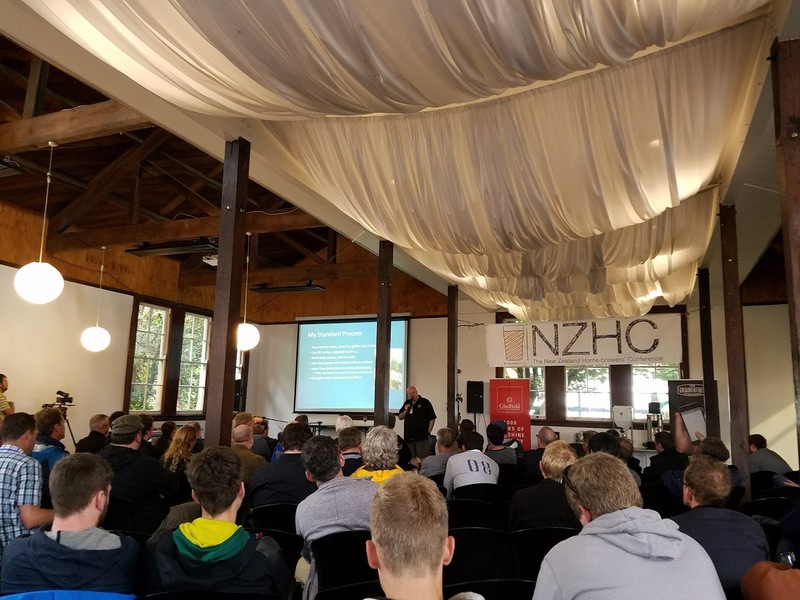 Nelson, New Zealand and the 2017 NZ Home-Brewers Conference was the most recent thanks to organizers Karl, Ed, and Mike! We left our house in Washington, DC on Thursday afternoon and after three flights and a total of 24 hours in transit we arrived in Christchurch on Saturday afternoon. The city was hit by an Earthquake in 2011 that killed 183 people and is still knocking down damaged buildings. We were surprised how quiet it was on the weekend, I guess when the area around it is so beautiful, why live downtown? Our first stop between the airport and our AirBnB was Pomeroy's Pub for two sampler trays (one of theirs and one of other local beers). 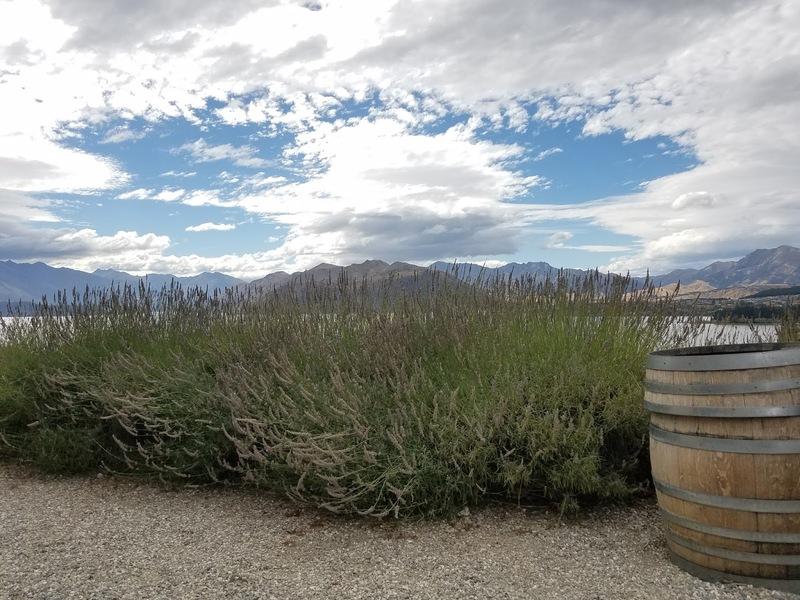 It set the tone for much of the beer on the South Island, lots of British-inspired, with some American craft beer leanings, and the foundation for emerging local trends. 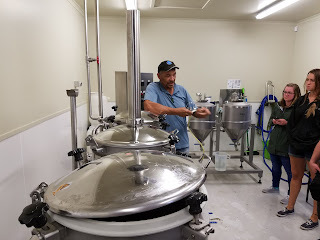 The next day we met with the Chch Homebrew Association at Volstead Trading Company (excellent beer bar) and then onto dinner at Twisted Hop Pub (a local brew pub) with a few of them. Both breweries we visited in Chrischurch had some excellent house beers (Pomeroy's English Mild and Twisted Hop Twisted Ankle) and some I'd rather forget... from their guest taps with overdone adjuncts. We also stopped by FreshChoice for bottled beers to sustain us on the trip around the country. Despite being hyped in America, New Zealand hops aren’t especially played up. Almost all of the local IPAs that highlighted a particular variety used American hops (e.g., Liberty Citra Double IPA). It was actually the emerging New Zealand Pilsners style that usually showcased Nelson, Motueka, and Riwaka! In general I was let down with the lack of local adjuncts used (certainly a handful of honey, wine grape, and manuka-smoked beers) especially from the likes of Garage Project. Freshness was a big issue too, many beers are given long shelf-life (12-18 months) and still a good number were out of code. I bought honey at a self-serve roadside honey shack, and Audrey tracked down thyme honey for me at a farmer's market. Regrettably I didn't get to come home with hops (I'll have to order some in a few months when the new harvest is pellitized). One interesting note is that bars are required to serve at least one low alcohol beer, which adds an incentive to brewers to brew them. The best of the ones we tried was White Mischief, a peach gose from Garage Project. The North Island, especially Wellington, is the center of the brewing industry, but there are still quite a few breweries in and around the cities on the South Island. After a couple days we set out on a circuitous five day route to Nelson. We drove about three hours a day, but the scenery was beautiful and ever-changing. 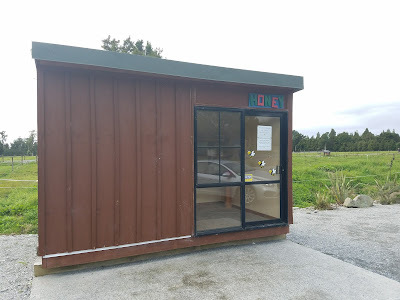 Down through Tekapo (a dark sky reserve) for stargazing at Mount John University Observatory, by Lake Wanaka (with a stop at Rippon Vineyards for beautiful scenery and serious natural fermentations), and up the West Coast with hikes to Franz Joseph glacier and onto Fox glacier by helicopter. We walked along the coast at Gillespies Beach, where there was no shortage of flat rocks, and a calm inlet perfect for skipping. 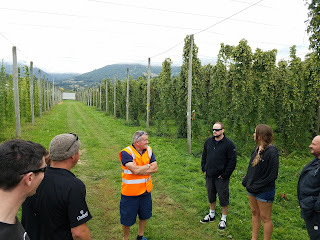 Our first day in Nelson we went on a tour of the New Zealand's hop growing infrastructure. Along with 20 local homebrewers we were joined by the other Americans (BJCP President Gordon Strong and Brulosophy Captain Marshall Schott). We essentially ran the steps that hops take in reverse order. Starting at NZ ("N-Zed") Hops. This is the cooperative processor owned by the hop farmers. The guide noted that a few more farms were coming online this year and they expect a substantial expansion in acreage over the next three years. This is the building where your Nelson, Mouteuka, and Riwaka (if you can get it) are pelletized and packed for distribution. Harvest was well underway (an average year) and the place smelled intensely resiny. 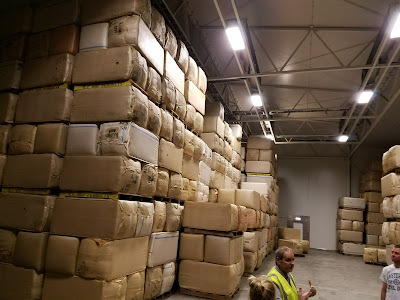 I would have loved to see the pelletizer in action, but the highlight was the storage room, it was like something out of the end of Raiders of the Lost Ark. Up until now they have only done larger packages in-house, but starting this year they will be packing 100 g and 1 kg packages on a new machine. 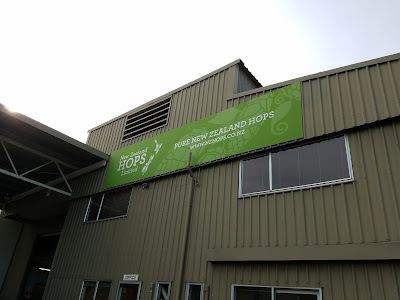 Next we were onto Mac Hops, the largest grower in New Zealand. That day they were harvesting Green Bullet (the hop, as we were told several times, is the signature of Steinlager). They grow a variety of hops to stretch the harvest season. The machinery was fascinating, and we could get a bit closer than I would have expected. 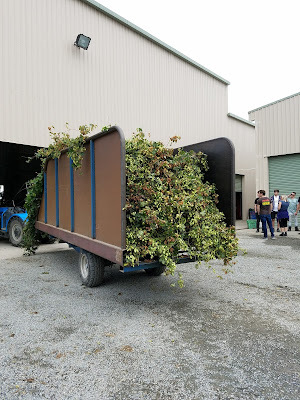 They dry and bale the hops on site and send them to NZ Hops where they are tested for moisture before processing. 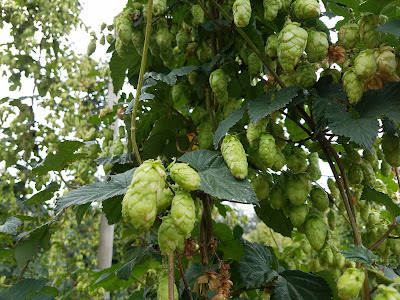 I took a few videos of the various stages going from bines to dried whole hops (sorry for a few vertical shots mixed in...). They are basically in order from the bines hanging moving to have their hops plucked off, through the machines that remove leaves, and finally to loading dried hops into the baler. We didn't get to see into the oast, so the drying process isn't recorded. They are selling this 50 acre farm (to a private equity group that Modern Times has signed a bunch of contracts with) and using the proceeds to purchase 100 acres of land to build a new farm. We had lunch at The Moutere Inn (the oldest pubs in New Zealand) where I tried Townshend Trial Hop 2 an subtly hopped beer brewed with an experimental variety (later I'd hear it was one of the breeder's current favorites, more herbally-balanced than the big tropical bombs they are known for). 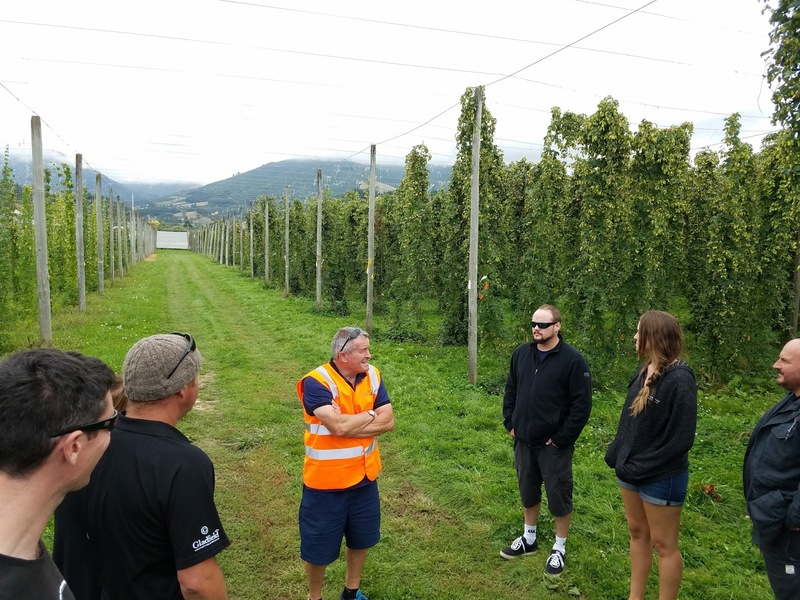 Our final stop was at the New Zealand Hop Research Station. Our group started in their test brewhouse (for single-hop trial batches). Here promising hops are added to a simple standard base beer, something like a Pilsner fermented with US-05. They use a neutral bittering hop and load up the experimental hops at the end of the boil and in dry hopping. Regrettably they didn't serve us any samples! Dr. Ron Beatson gave us a tour of the field, has been the driving force behind their breeding and selection programs. We didn't get to see the Nelson Sauvin "mother" (the one that all are propagated from) but we did see a few of her daughters. He cracked a few jokes about selecting the Cascades (now called Taiheke) for their breeding program in the 1980s. While some of their hops are bred manually, others are in secret test sites around the country with several female plants and a single male to pollinate. He said the same thing I had heard about Riwaka, beautiful hop (my Riwaka Hefeweizen), terrible agronomic properties. 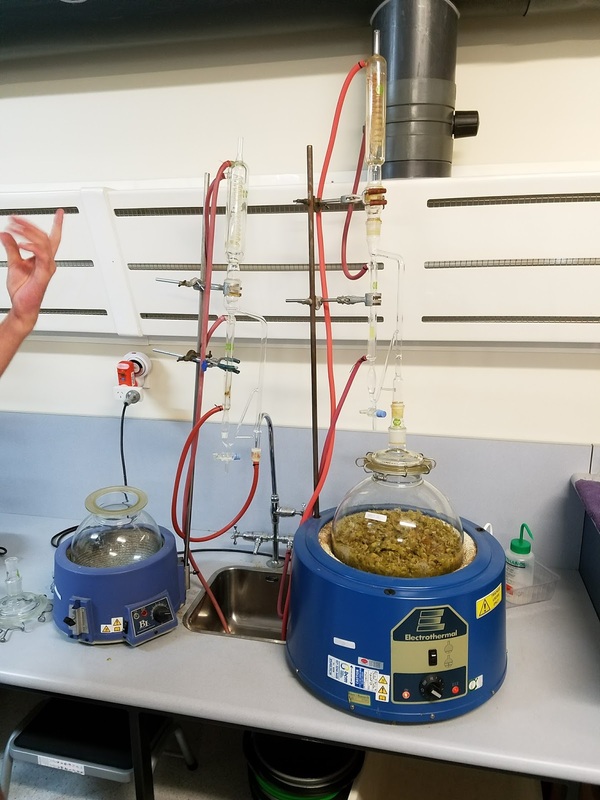 Our last stop was a tour of their chemical analysis lab where we got to smell samples of hops and some concentrated oils they had steam distilled. The lab also handles fruit analysis, and it was blueberry season. The next night I was honored to be asked to judge at BrewMania. A bit less so when I realized all 100 homebrewers there were also judging. It is a really unique contest with less structured judging (and feedback) than the standard BJCP contest. To be eligible for the overall win each brewer is required to submit three beers. The 10 tables are each presented with four beers for each round with no stylistic consistency, and each judge gets three bottle caps to vote for their three favorite beers. The beer that receives the fewest votes is eliminated. If any of your three beers are eliminated, so are you! For the final round of the night each table gets the complete flight from two remaining brewers head-to-head. This whittles the 20 remaining brewers down to 10. The goal is to showcase your range of brewing skill, so when picking between equally good flights the one with more variety (saison, Baltic porter, and coffee IPA) is preferred over limited range (APA, IPA, and DIPA). 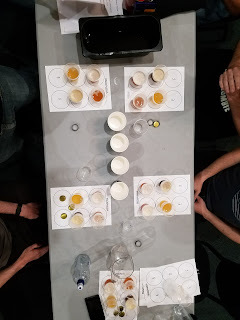 The next morning I really was honored to participate in the best of show where along with Gordon, Marshall, and a few local judges to select the top three brewers. The winner didn't quite have the variety we were looking for, all were pale fruit beers (rhubarb Berliner, apricot sour, and raspberry saison), but they were of a higher quality than any of the other entrants. Saturday was another unique event, MarchFest: a beer and music festival at Founders Park where each of the 16 participating breweries releases a new beer at the festival. It included a few excellent hoppy beers (Eddyline Black IPA and Moa Riverside Recliner) considering their freshness. Rain didn’t dampen the enthusiasm of the crowd, although the full pint option for pours may have had something to do with that! During the first few hours of the event I brewed a version of Nu Zuland Saison with Jamie McQuillan. He's a sour specialist, reigning NZ Homebrewer of the year (including the top beer with a 49 with his riff on my no-boil Berliner with plums), and as I found out the next day winner of BrewMania 2017! He's also in the process of opening a brewery (New Zealand is much less strict, so he'll be able to essentially sell homebrew at first). 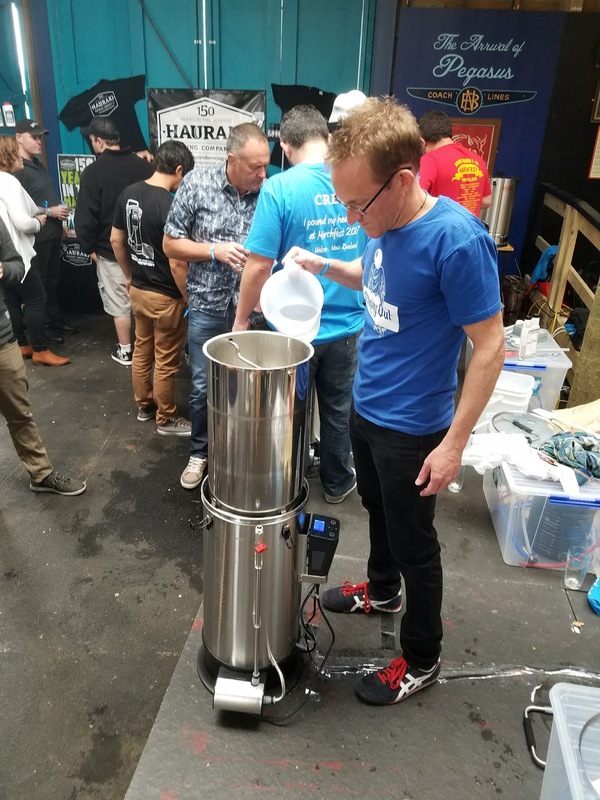 It was my first time brewing on a Grainfather. Surprisingly compact, and a smooth brew day considering we were out of our element and people were coming up to ask questions. We did neglect to realize it had an automatic 60 minute boil shutoff timer which threw off our timing (not bad for the worst mistake the first time brewing on a new rig). Malt was mostly local Gladfield Pilsner, which was surprisingly toasty. Without a way to reseal the 100 g of Nelson Sauvin for late-fermentation dry hopping we opted for only two additions, hop-stand and brew day dry hop. We pitched Belle Saison along with the dregs from two bottles of each of our homebrew. Excited to hear how it turns out when they hold the tasting between our batch and the ones brewed by Gordon and Marshall! My last full-day was spent talking and listening at NZHC. Nice to attend a homebrewing conference in English after Florianopolis, Brazil and Drammen, Norway (my Portuguese and Norwegian are not strong). I presented about the advantages homebrewers (BeerSmith podcast on the same topic) have over commercial brewers to the general session, and then about sour beers to a break-out (along with head brewers David Nicholls of Moa and Jason Bathgate of MacLeod). 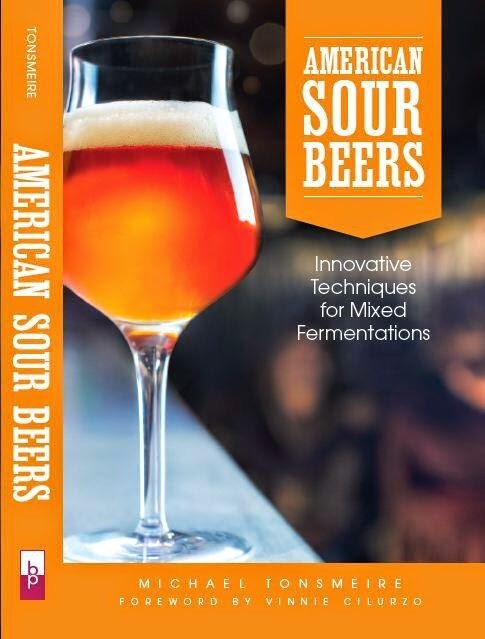 Good response, and glad that sours are taking hold! As several people mentioned, New Zealand is still a few years behind the US, but that gap is closing quickly! It was nice to catch-up with my friend Sean Gugger, who took some time to come to Nelson in the midst of nine month working at Batch Brewing in Sydney (not to be confused with Bach Brewing in New Zealand). He met up with us at the after-party at The Free House where I had one of the best hoppy beers of the trip, Behemoth 6 Foot 5 from Andrew Childs who had sat on the Going Pro panel earlier in the day. Also had fun chatting with Annika Naschitzki of Tiamana, a passionate German brewer. With our ten days spent we started the long trip home. With the International Date Line working in our favor we landed in San Francisco 8 hours before we took off from Auckland. As a weird side-note, being in the Southern Hemisphere for the vernal equinox meant that we'd been in all four seasons during a two week period: when we left DC it was winter and then arrived in New Zealand for the end of summer, by the time we left it was autumn and returned to spring. Great run down. It's a pity you didn't get to spent a few days in Wellington! 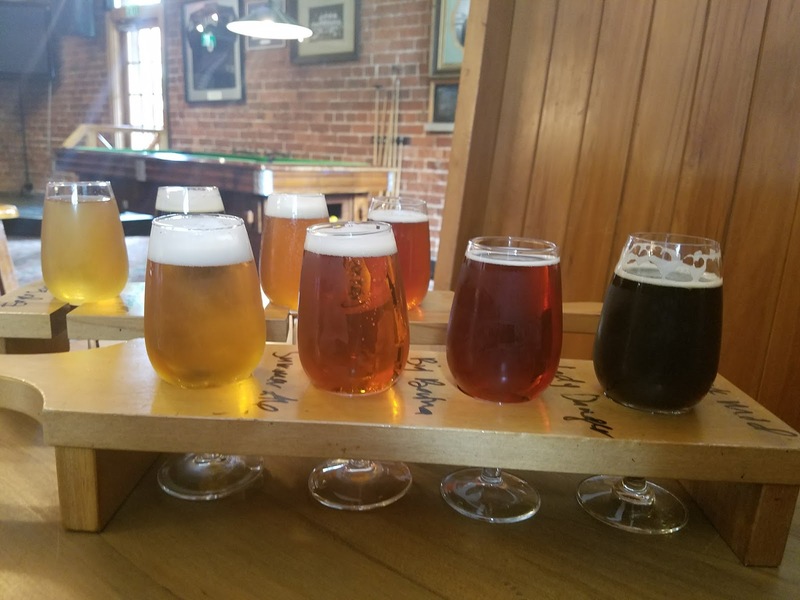 One clarification - beers are not required to brew low strength beers all bars are required to serve one (including brewery bars and tasting rooms), but if a brewery doesn't want to make one, they do not have to. Oops! That should read "Brewers are not required to brew low strength beers". Thanks for the clarification, sounds like it must help get a beer on tap given the requirement! You mentioned one beer from Eddyline, but did you hit their brewpub in Nelson? Next to Garage Project I thought they had the best beers I had in NZ last fall. It should be mentioned that Freehouse was one of the first pubs in NZ to not be contracted with a single brewery. Also, how did you like the beer prices vs. wine prices, insane. Selling homebrew is legal?! Nice! Home brew isn't legal to sell per se, but it's not too difficult to go through the process of getting all the required permits. Essentially you just need to have a customs control area and records to keep track of your excise tax liabilities as well as some basic food safety programs. One of the most interesting breweries in the country brews 100 liter batches in their basement with a barrel "warehouse" in their garage. It's a bit of a mixed blessing because it makes it easy for people to get their product to market, but it also allows people who don't really know what they are doing to get to market as well. So glad you came over to NZ for the conference. It was super rad to get to chat with you and your wife during Marchfest and your keynote during the HBC was so freakin wonderful!